PHS JROTC cadets C/1LT Gaven Boydstun, C/LTC Jessica Smith (Commander of the color guard), C/SGT Madeline Pierce, and C/CPT Jose Banuelas entering the drill pad. Cadets marched onto the field carrying their color guard equipment after a long three hours of waiting to compete. The cadets made their way to where the judges were waiting for them to report in. 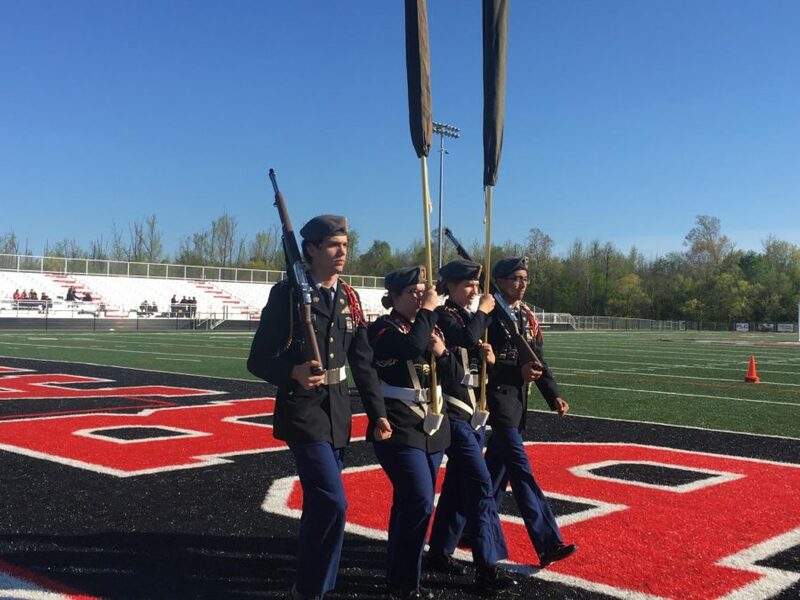 After the color guard team received permission to execute their routine, the four cadets performed to the best of their ability; these cadets were fighting to come out on top. This color guard team had practiced several times in the last few weeks in order to prepare for this drill meet. They worked on sharpness, staying in sync with one another, and professionalism with each command so that they could look their best during their performance at the final drill meet of the year on April 2, 2019. They were determined to make this competition their best one yet. The team was tedious with each movement that the commander C/LTC Jessica Smith gave them. Cadets Gaven Boydstun, Jessica Smith, Madeline Pierce, and Jose Banuelas were relieved when they finished the routine; however, they had to wait for the awards ceremony to occur before finding out if they placed. While these four cadets were walking away from the drill pad, people were giving them words of encouragement of how well they performed. Color Guard was not the only team that competed at this drill meet from the PHS JROTC Program. There was also an Armed Squad and Unarmed Squad. After the coordinators of the drill meet cleaned up the area, they brought out the table stacked with trophies. All the schools that competed that day rushed to the middle of the field to form their own formation. There were looks of nervousness and excitement on every cadets face because they were anxious to see how well they had done. Sergeant Major Fitts, who resides at the JROTC building in Brandon, began calling the names of the schools that placed. There were five categories: Armed Squad, Unarmed Squad, Armed Platoon, Unarmed Platoon, and Color Guard. Each section had a first place, second place, and third place winner. Sadly, the PHS JROTC did not place in color guard or anything else they competed in. Looks of disappointment spread throughout the company that was formed, but they perked up when they realized that they have next year to make an amazing comeback. “Our cadets executed each routine with precision and poise. The color guard and squads performed every aspect of regulation drill with pride and professionalism second to none. Personally, I am so proud of each and every one of them for what they have managed to accomplish this year,” said Colonel Hargett. Although the PHS JROTC fell short in outdoing the other schools, they walked away happy and ready to hit next year head on. As the cadets were walking back to the bus, they were encouraging each other and saying that they would make it next year. “As a whole the color guard and other teams performed their very best, and I am proud to have had the opportunity to be able to command all of these exceptional cadets,” said Battalion Commander C/LTC Jessica Smith. Every team that competed within the PHS JROTC Battalion showed up to shine, and that is exactly what they did even though they fell short. Cadets walked away knowing the techniques they needed to perfect by next year’s competition.